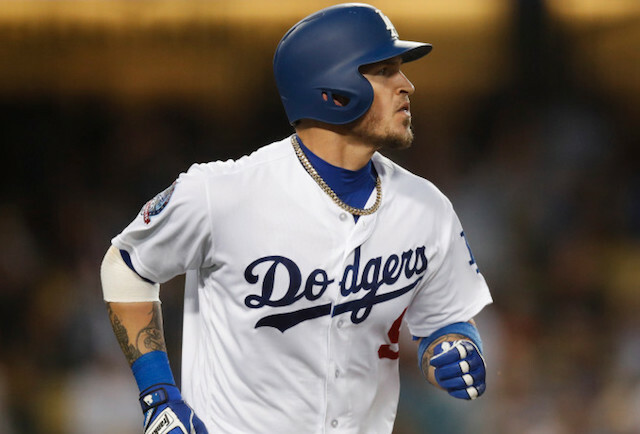 The Los Angeles Dodgers are slated for a busy offseason, needing to fill holes at multiple positions including catcher, second base and the bullpen. While there are many intriguing starting pitching options in both free agency and the trade market, the Dodgers appear set in that department for the 2019 season after a slew of early offseason moves. The club reached a three-year extension with longtime ace Clayton Kershaw while fellow southpaw Hyun-Jin Ryu also returns to the mix after forgoing free agency and accepting the one-year, $17.9 million qualifying offer. Still, nothing can be ruled out given Dodgers president of baseball operations Andrew Friedman’s track record of making deals. Facing a roster crunch this offseason, there could be a number of trades that take place to clear salary and open the door for potential additions. Friedman previously hinted that the Dodgers may pursue Japanese star pitcher Yusei Kikuchi once he was posted by the Seibu Lions. In preparation of a move to the Majors, Kikuchi hired Scott Boras to represent him in contract negotiations. One area of concern that the Dodgers will certainly address this offseason is the bullpen. The unit as a whole was dependable in 2018, posting a collective 3.72 ERA and .689 opponents’ on-base plus slugging percentage — both of which ranked eighth in all of baseball. That being said, the Dodgers still struggled to replace Brandon Morrow with an established eighth-inning bridge to Kenley Jansen. Finding a setup man this winter figures to be a top priority, and luckily, there are many quality options available on the free agent market. 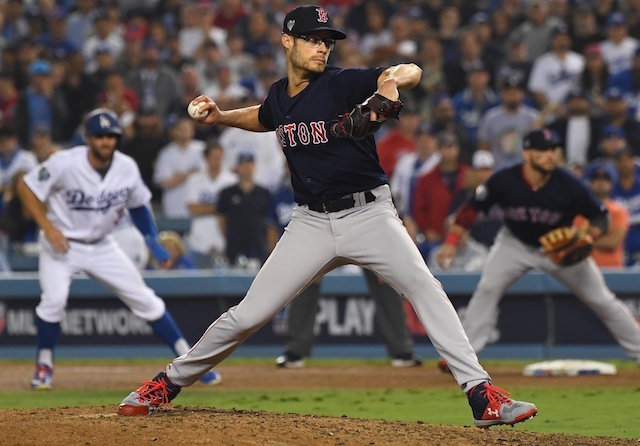 One arm that stands out is Joe Kelly, who Dodgers fans have become quite familiar with in recent postseason series. The 31-year-old was a dominant force in the Boston Red Sox bullpen during the 2018 World Series, logging six scoreless innings with 10 strikeouts over five appearances. Kelly was also solid in the regular season despite posting a 4.39 ERA over 65.2 innings of work, registering 9.3 strikeouts per nine with even better peripherals (3.57 FIP). The right-hander’s fastball was easily his most productive pitch in 2018, earning a value of 4.1 per FanGraph’s calculations. Kelly’s heater also averaged 98.5 mph on the year — the second-highest mark of his career (99.2 mph in 2017). Adding that kind of speed to the Dodgers bullpen would be a welcome addition, as the group currently lacks in hard-throwers with the exceptions of Pedro Baez and Jansen. Another flame-throwing right-hander Los Angeles could conceivably target is Adam Ottavino, formerly of the Colorado Rockies. The 32-year-old was dominant in 2018, posting a 2.43 ERA, 2.74 FIP and 0.99 WHIP over 77.2 innings of work — his most since 2013. Ottavino struck out a career-high 13 batters per nine innings while significantly cutting back on walks (6.6 per nine to 4.2) and home runs allowed (1.4 to 0.6) when compared to a year ago. More impressively was Ottavino’s success at the hitter-friendly Coors Field last season. He posted a 2.10 ERA in his home ballpark but also thrived on the road as well (2.70 ERA). Given his familiarity in the National League West, Ottavino would be a natural fit in the Dodgers bullpen. He does own a lifetime 5.30 ERA at Dodger Stadium, but simply not having to face the Los Angeles lineup anymore could do him wonders. As for free agent left-handed relievers, Zach Britton stands out as the cream of the crop. The Dodgers have been connected to him in trade rumors for the past two years, so it wouldn’t be surprising if they pursue him once again. Another notable options is Andrew Miller, who’s coming off an injury-ridden 2018 season in which he was limited to 34 innings pitched. His numbers across the board ballooned as a result, so teams interested in signing Miller will have to bank on him bouncing back next year. The southpaw’s former Cleveland Indians teammate Cody Allen is available as well. He, too, saw his statistics decline in 2018 after enjoying a dominating five-year stretch as the club’s closer. Presumably cheaper but still solid arms the Dodgers could look to add include Brad Brach, Kelvin Herrera, David Robertson and Joakim Soria. A reclamation project Los Angeles should consider is Carson Smith, who was surprisingly outrighted to the Minors by the Red Sox, paving the way for him to elect free agency. Still just 29 years old, Smith emerged as one of the best relievers in all of baseball as a member of the Seattle Mariners in 2015. Injuries have hindered him over the past three seasons, but he has proven to be a force when healthy.